To celebrate Volunteers Week 2015, Volunteer Centre Salford organised a pop up market, ran the #SalfordVolunteerSelfie campaign and launched round three of the Volunteer Expenses Fund. The Volunteering Pop Up Market was a great success helping to promote volunteering in Salford and giving groups the chance to showcase what they do and their volunteering opportunities! See our Storify for highlights of Volunteers' Week in Salford! Volunteer Centre Salford support Keep Volunteering Voluntary and promoted the campaign during Volunteers' Week. 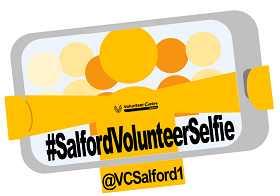 We ran our volunteer selfie campaign on twitter, this year all selfies were entered into a raffle you can view all the entries at #salfordvolunteerselfie. Congratulations to Home-Start Trafford and Salford who won the £50 gift voucher! Salford CVS celebrated Volunteers' Week 2015 with the launch of round three of the Volunteer Expenses Fund. The Salford Volunteer Expenses Fund is an initiative that Salford small voluntary and community groups (annual income below £100k) can apply for up to £600 in order to meet the cost of paying out volunteer expenses. Applications have now closed. The next round will be open in the next quarter of the year.